Humpback chub. Photo by Randall D. Babb. If you want to know where you would have stood on slavery before the Civil War, dont look at where you stand on slavery today. Look at where you stand on animal rights. Paul Watson. The following is a document archive for the native fish of the Colorado River, which have the highest rate of jeopardy toward extinction in the nation. Read article here. Historically, the native fish fauna of the Colorado River Basin was dominated by the minnow (cyprinids) and sucker (catostomids) families. Of the 34 known native species to the Colorado River basin, 74% are found nowhere else in the world, or endemic. 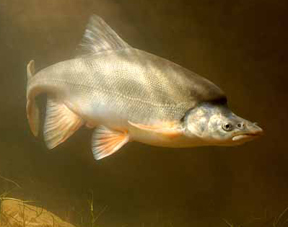 Threats to these species include streamflow regulation and habitat modification, altered food web, predation by nonnative fish species, parasitism, hybridization with other native fish species, and pesticides, toxins and pollutants. These changes to the river environment have occurred so quickly that the species have been unable to a adapt, so pro-active human intervention is the only hope they have. Since the river is truncated by 83 dams in the upper basin and 10 dams in the lower basin, this loss of genetic diversity will also impede their recovery. Climate Change Effects Proposed Actions Effects On Proposed Actions Under NEPA. Dinah Bear. Overview by Maddux et al. 1993. Green River from Gates of Lodore (Dinosaur National Monument) to the Colorado River confluence, Colorado and Utah. Yampa River in Dinosaur National Monument, Colorado. White River from Rio Blanco Lake Dam to the Green River confluence, Colorado and Utah. Duchesne River from river mile 2.5 to Green River Confluence, Utah. Colorado River from Colorado River Bridge (I-70, exit 90 in Rifle) to North Wash (Lake Powell), Colorado and Utah. Gunnison River from the confluence of the Uncompahgre River to the Colorado River confluence, Colorado. San Juan River from State Route 371 Bridge (Farmington) to Neskahai Canyon (Lake Powell), New Mexico, Colorado and Utah. Colorado River from confluence of Paria River to Imperial Dam, Arizona, Nevada and California. Little Colorado River from river mile 8 to Colorado River confluence. Gila River from New Mexico border to Coolidge Dam, Arizona. Salt River from Highway 60 Bridge to Roosevelt Diversion Dam. Verde River from boundary of Prescott National Forest to Horseshoe Dam. Note: Includes 100-year river floodplain and full pool elevation of reservoirs. Lake Powell is not critical habitat except for the uppermost arms of San Juan and Colorado rivers. Total river mileage is 1,980. 2003 - A Conservation Plan for Native Fishes of the Lower Colorado River. Minckley et al. 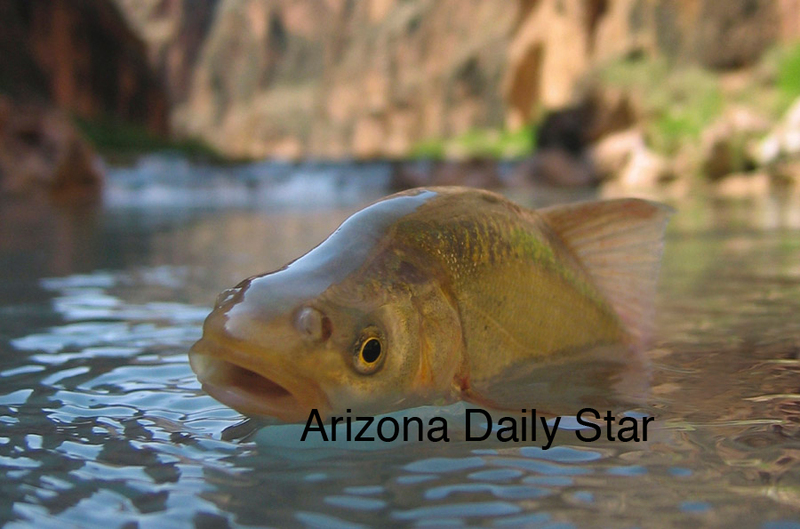 2003 - Part One: Status Report of Listed Arizona Fishes in Gila River Basin With Recommendations for Recovery. Desert Fishes Team. 2003 - Part Two: Status Report of Listed Arizona Fishes in Gila River Basin With Recommendations for Recovery. Desert Fishes Team. 2003 - Part Three: Analysis of Recovery Plan and Implementation for Threntened and Endangered Fish in the Gila River Basin. Desert Fishes Team. 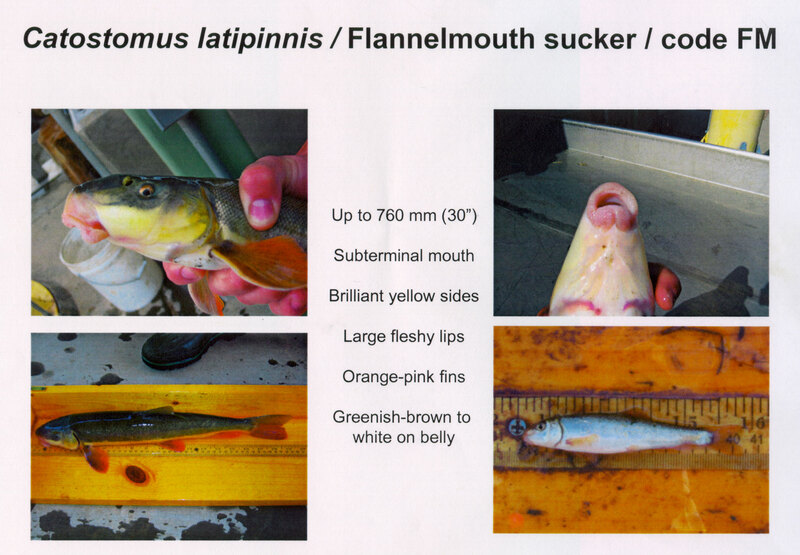 BIOLOGICAL OPINIONS/MEMOS by US Fish and Wildlife Service unless specified. 1995 - Memo in response to 1994 BiOp. Reclamation. 1997 - Instream Flow Recommendations Lower Gunnison. Burdick. 2008 - Biological Assessment, Aspinall Unit (Gunnison River). Reclamation. 2008 - Abundance Trends & Status of LCR Population of HBC with data from 1989 to 2006. Coggins. 2009 - Abundance Trends & Status of LCR Population of HBC with data from 1989 to 2008. Coggins. 2010 - Biological Assessment, Green River Pumping Project. Reclamation. 2010 - Biological Opinion of Green River Pumping Project. USFWS. 2005 - Predatory Fish Removal and Native Fish Recovery in the Colorado River Mainstem. Mueller. 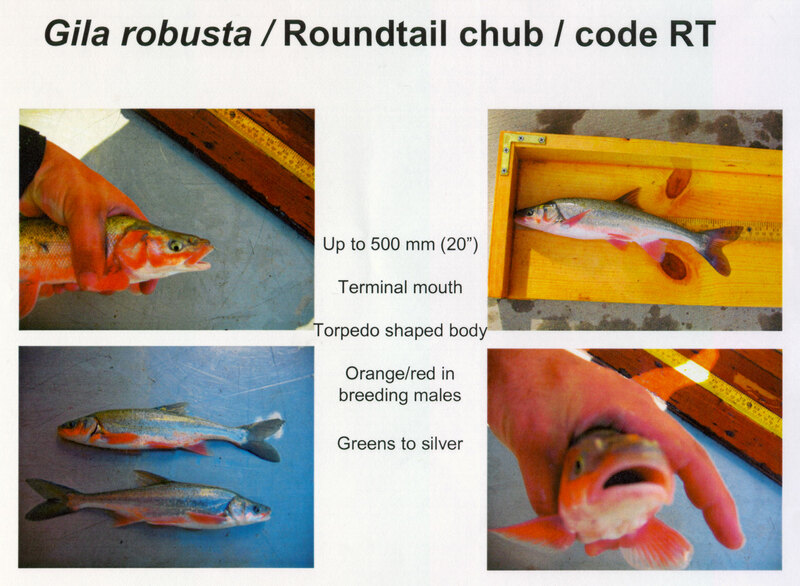 2011 - Humpback Chub Five-Year Status Review. 1998 - Geomorphology and endangered fish habitats of the upper Colorado River. Vanstetter. 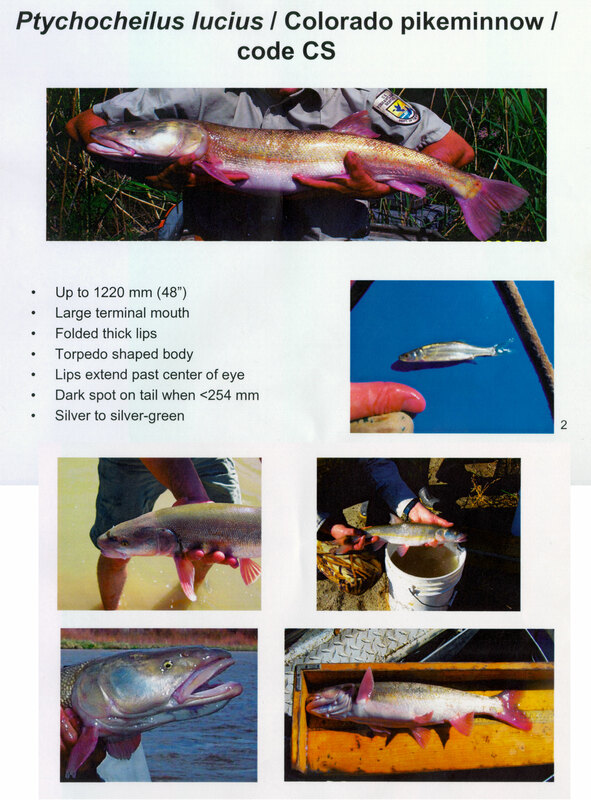 1998 - Status and Trends of Colorado Pikeminnow. Osmundson et al. 2001 - An Evaluation of the Role of Tributaries for the Recovery of Endangered Fishes in the Upper Colorado River and Recommendationsfor Future Recovery Actions. Tyus and Saunders. 2001 - Comments on the recovery goals for endangered fish. Coggins and Gloss; GCMRC. 2003 - Populations Estimates for Chubs in Westwater Canyon. Utah Division of Wildlife. 2006 - Upper Colorado River Endangered Fish Populations. UCR Recovery Program. 2007 - Utah conservation plan for threatened fish species. Utah Division of Wildlife. 2007 - Analysis of Dissolved Selenium. Thomas, et al. 1992 - Dolores River Native Fish Habitat Study. Valdez, et al. 2000 - Effects of Tusher Wash Diversion Dam on Native Fish. Utah Division of Wildlife. 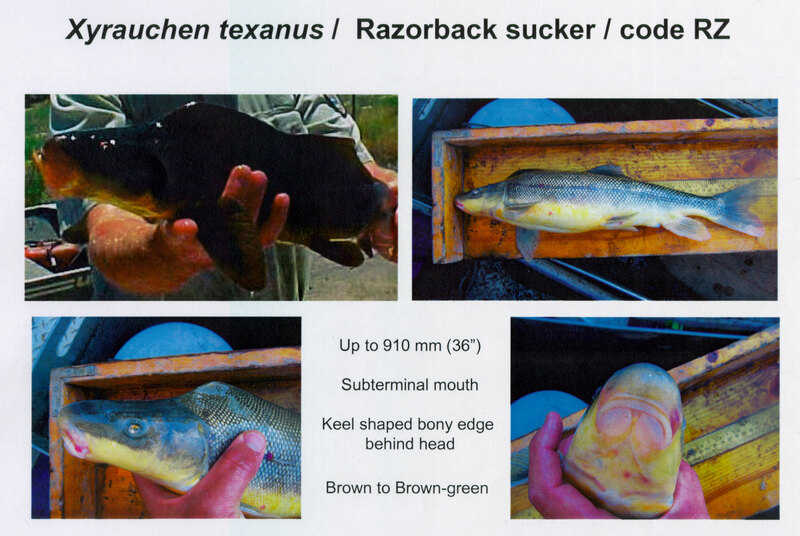 2002 - Status of Wild Razorback Sucker in Green River. Bestgen. 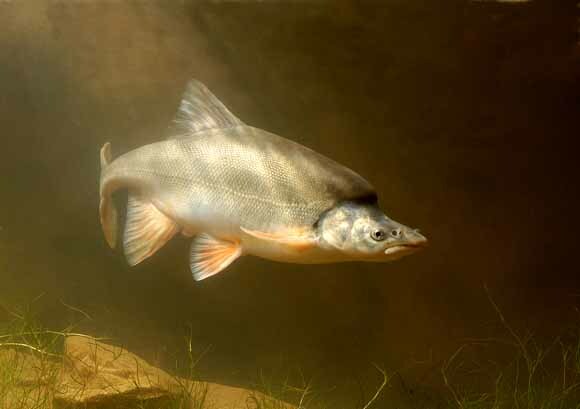 1990 - Endangered Fish of Cataract Canyon. Valdez. 1999 - Driftwood: an alternative habitat for macroinvertebrates in a large desert river. Haden et al. 1999 - Movement patterns, behavior, and habitat use of razorback sucker stocking into the Green River at Canyonlands National Park, Utah. Foster et al. 2000 - Spatiotemporal Variation in Length-Weight Relationships of Endangered Humpback Chub for Conservation and Management. Meretsky et al. 2003 - Benthic Community of Colorado River in Canyonlands. Haden. 2008 - Population Estimates for Humpback Chub in Cataract Canyon 2003-2005. Badame. 1996 - Colorado Pikeminnow Distribution and Movement. Ryden. 1994 - Management of Discharge, Temperature, and Sediment in Grand Canyon for Native Fish. Clarkson et al. 1996 - Organic Drift In Regulated Desert Rivers. Shannon. 1997 - Habitat Relationships of Subadult Humpback Chub in the Colorado River through Grand Canyon. Converse et al. 1998 - Algal Ecology Tailwater below GC Dam. Blinn. 1999 - Response Benthose Organic Drift to Controlled Flood. Blinn. 2000 - Reservoir River Linkages Colorado River below GC Dam. Benenati. 2000 - Leaf Breakdown Regulated Colorado River. Pomeroy. 2001 - Drifting Particulate Matter Below GC Dam. Benenati. 2002 - Monitoring and Research: The Aquatic Food Base in the Colorado River, Arizona During 1991-2001. Benenati et al. 2004- Evidence for the failure of the modified low fluctuating flow. Korman et al. 2005 - State of the Colorado River in Grand Canyon. US Geological Survey. 2007 - Abundance Trends and Status of the Little Colorado River Population of Humback Chub: An update Considering 1989 - 2006 Data. Coggins. 2010 - Colorado River Fish Monitoring in Grand Canyon 2000 - 2009. USGS. 2013 - Grand Canyon & Glen Canyon Comprehensive Fisheries Plan Environmental Assessment & FONSI. 1999 - First Meeting of Lower Colorado Recovery Implementation Plan by the Scientific Work Group (RIP SWG). 2002 - Lost, a desert river and its native fishes: A historical perspective. Mueller and Marsh. US Geological Survey. 2000 - Salton Sea FEIS. USBR. 2005 - Salton Sea Pilot Project EA & FONSI. USBR. 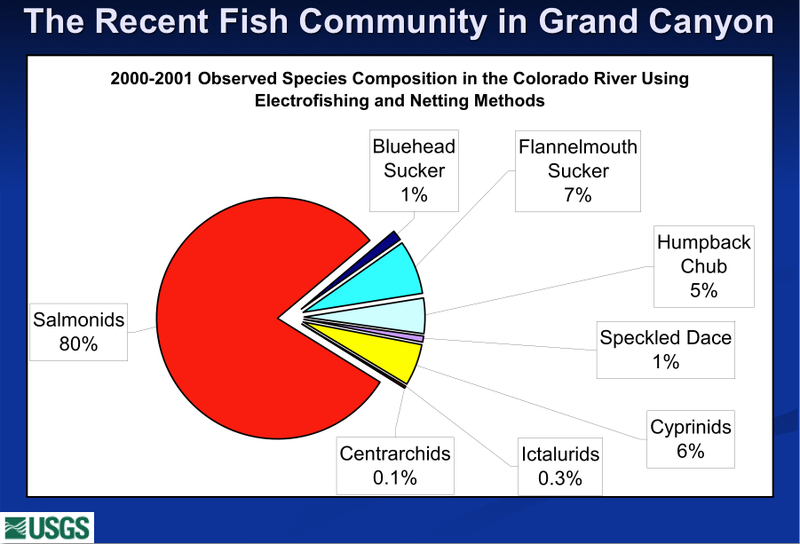 Pie chart of fish communities in Grand Canyon. USGS. 2010 - One tough sucker. High Country News. 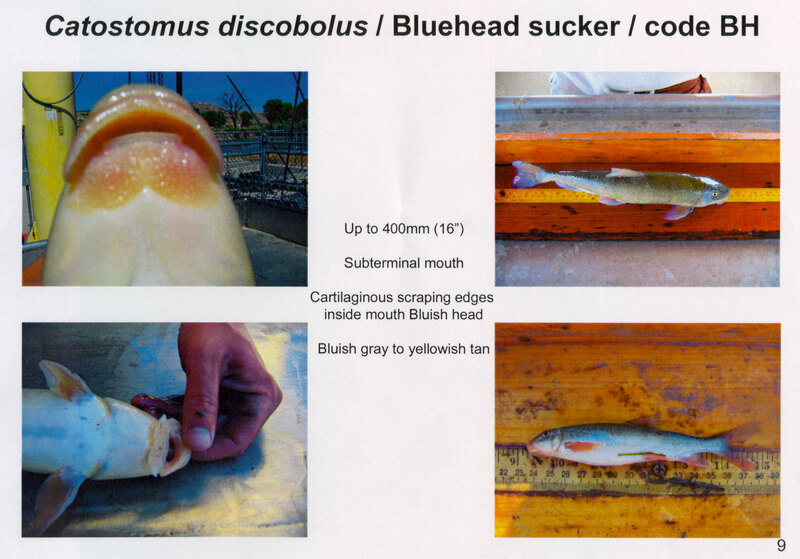 2018 -Species Status Assessment Report for the Razoback Sucker. USFWS. 2014 - Conservation to Stem Imminent Extinction: The Fight to Save Razorback Sucker in Lake Mojave and Its Implications. Marsh et al. 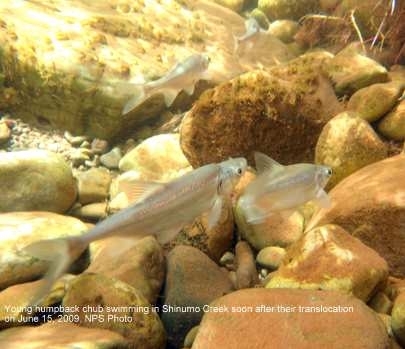 2008 - Active Adaptive Management for Conservation of Native Fish in Grand Canyon. Coggins. 2007 - Water availibilty from Flaming Gorge Reservoir. Reclamation. 2000 - Scoping Comments on EIS for Flaming Gorge Dam. Living Rivers. 2001 - Comments on Recovery Goals for the Colorado River Endangered Fish. GCMRC. 2001 - Comments on Recovery Goals for Colorado River Endangered Fish. Living Rivers et al. 2002 - Letter to department of Interior demanding action on restoration of Grand Canyon. Living Rivers. 2003 - Concerns regarding Glen Canyon Dam Adaptive Management Program. Living Rivers. 2004 - Scoping Comments for Environmental Impact Statement for the Aspinall Unit of the Gunnison River. Living Rivers. 2004 - Calling for SEIS on Glen Canyon Dam. Living Rivers. 2004 - Demanding BuRec action to correct failing federal program to recover Grand Canyon native fish. Living Rivers. 2004 - DEIS: Flaming Gorge Dam. Living Rivers. 2007 - EIS: Long-Term Experimental Plan. Living Rivers. 2008 - LR comments on EA for operations at Glen Canyon Dam 2008-2012. Living Rivers. 2009 - DEIS: Aspinall Unit. Living Rivers. List of extirpated species in Grand Canyon. 2009. Collaborative Management of Glen Canyon Dam: The Elevation of Social Engineering over Law. Joseph M. Feller. Resolutions (including ESA reform). Colorado River Water Users Association (CRWUA). Undamming Glen Canyon: Lunacy, Rationality, or Prophecy. Scott Miller.